A mainly sunny sky. High around 70F. Winds ESE at 5 to 10 mph.. Partly cloudy. Low near 45F. Winds SW at 5 to 10 mph. A billboard for an auto injury law firm watches over traffic on Pikes Peak Avenue on Saturday, February 3, 2018. More than two decades of TV ads touting eye-popping cash awards turned Aurora personal injury lawyer Franklin D. Azar into a household name in Colorado. They also created a conundrum for consumers, who stand alone when it comes to figuring out if Azar's and other personal injury lawyers' oft-repeated promises of a hassle-free payday are actually true, a result of Colorado's hands-off approach when it comes to regulating attorney advertising. Nearly 40 years after the U.S. Supreme Court struck down bans on commercial speech by attorneys - paving the way for today's glut of TV spots by Azar and his competitors - Colorado keeps lawyers who advertise on a kind of honor system, trusting them to abide by state ethical rules that bar false and misleading claims in advertising. Regulators in a state disciplinary body, the Office of Attorney Regulation Counsel, do not preapprove ads or take steps to monitor them, and only if someone lodges an official complaint do the regulators delve into the fine print. It's a system that has worked for decades without controversy, said state Attorney Regulation Counsel Jim Coyle, who said he hears from few critics of the issue and sees little reason for change. "We're a complaint-based system," Coyle said. "We just haven't been getting complaints on attorney advertising." Indeed, lawyer advertising has not even made it onto his radar screen: "I don't think we've ever had an advertising case where we went after a lawyer for misstatement of fact in the lawyer's advertisement." Coyle said he could not provide specific data on how many complaints, if any, have been filed in recent years, saying such information is private under confidentiality rules. In Colorado, complaints against attorneys can only be made public if they are upheld by state regulators. Should the office receive such a complaint, regulators must demonstrate by "clear and convincing evidence" that the advertisement relied on a misstatement of fact in order to result in action. He pointed out that Azar's law firm has never faced disciplinary action in Colorado for any ethical violations, including in the firm's advertisements. Short of barring attorneys from lying in print and on TV, there's little more to be done, given case law protecting commercial speech by attorneys, Coyle said. "I think it would be difficult to strengthen those rules based upon case law," he said. Critics say the lack of scrutiny comes with a cost - leaving some former plaintiffs to complain they were lured by promises of fast cash into signing up with a big-name advertiser, only to be persuaded to settle their claims for small amounts. Even if money for pain and suffering is left on the table, lawyers can still end up a winner, usually receiving 30 percent of each settlement without having to invest time or resources in litigation, said Colorado Springs attorney Sarah Christensen, who said such practices go hand-in-hand with attorneys who invest in boastful advertising. "Their business model appears to be getting rich off volume rather than delivering the highest quality of representation," she said. The clients, who have little insight into how negotiations work between plaintiffs' attorneys and insurance defense attorneys, may not even realize they're losing out, she said. "They're not coerced. They just don't know any better." Azar, who has in the past faced lawsuits alleging similar claims, has strenuously denied that his firm does any such thing. "While some firms may abuse advertising by creating high volume and relying on sub-optimal settlements, the Azar firm is not one of them, and any characterization of the firm as a 'plaintiff's mill' would be false and defamatory," an attorney for Azar, Gordon Netzorg, said in a three-page letter to The Gazette as this story was being reported. Other critics decry an advertising atmosphere that threatens to demean the legal profession, a longstanding theme of grumbling by attorneys who do not take out ads or who do so sparingly. Without commenting on the ethics of attorney advertising, or the tactics of those who engage in the practice, Colorado Springs attorney Gordon L. Vaughan suggested that television ads sometimes "fall short of projecting a professional image." "It's one thing to have an ad say, 'Here's who I am and here's what my credentials are,'" he said. "What I find to be problematic is the sort of 'Had a wreck? Get a check' kind of jingle" - one word off from a come-on used in the past by Azar: "In a wreck? Get a check." Those ads, Vaughan said, make him "want to throw bricks at my TV." 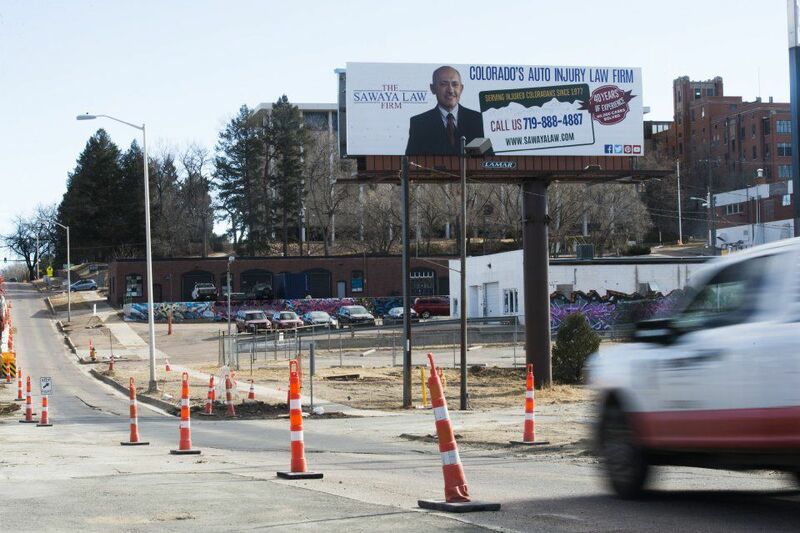 One plaintiffs' attorney who advertises heavily, Mike McDivitt, brushed aside questions of propriety, saying his firm's ads - seen on buses and billboards in Colorado Springs and Denver - are a crucial means of getting the word out about his firm's services. His ads avoid hyperbole, he said, and his firm ensures each complies with Colorado's Rules Of Professional Conduct for attorneys, screening them to verify they aren't misleading and that they do not make direct comparisons with other attorneys, two pillars of the state's ethical rules for advertising. "We're in the business of holding people accountable," McDivitt said. "Advertising is very important to get that message across." Colorado is among numerous states that have adopted the American Bar Association guidelines on attorney advertising, and its passive approach to enforcing them is the norm rather than the exception - generally the result of a lack of resources and concerns about incurring liability from infringing on attorneys' free speech rights. Lynda Shely, an ethics attorney in Scottsdale, Ariz., and a member of the ABA Standing Committee on Ethics and Professional Responsibility, which produces model rules that have been adopted throughout the country, said the prohibitions do a good job of curbing deceptive practices in advertising. "You can't lie. You can't misrepresent. You can't falsely claim we can guarantee a result," she said, arguing that existing rules leave little wiggle room. Shely said many complaints about attorneys who advertise come from competitors who find it "unseemly," in what she called a longstanding divide in the profession dating to the days before the nation's highest court effectively struck down advertising prohibitions in 1977 with its decision in Bates v. State Bar of Arizona. Decisions by state courts have since offered additional support for such speech. Shely downplayed concerns about people being tricked by effusive claims in television commercials, arguing that consumers have plenty of experience sorting through hyperbole in advertising. "They take it with a grain of salt that some of this might be bravado," she said, comparing attorneys' language to promises in daytime detergent commercials pledging to eradicate any stain. Even when complaints turn up valid claims of misrepresentation, such problems are generally settled quickly with an attorney's agreement to change or remove the offending ad, Shely said. They rarely make it to the point of an attorney being disciplined. The lack of an active role by the state has pushed debates over the veracity of attorney advertisements into online forums, where former clients compare notes, some complaining the rhetoric in TV commercials falls short of reality, and others reporting good results from big-name advertisers. A handful have brought claims they were misled by Azar's promises into the courts. Twelve years ago, a series of lawsuits against the Azar firm, premised in part on its allegedly misleading TV ads, made law in Colorado. The Colorado Supreme Court held that a former Azar client, Richard Crowe, was not barred as a matter of law from asserting a claim against Azar's firm for deceptive trade practices under Colorado's Consumer Protection Act, for false or misleading advertising. Crowe's case went to trial thereafter, and the Colorado Springs jury found no liability by Azar's firm. Befitting his self-styled reputation for toughness, Azar countersued Crowe and won, collecting a $300,000 judgment on the argument that Crowe had misrepresented his injuries, the Rocky Mountain News reported in 2008. Azar told the now-defunct newspaper he had spent $2.5 million defending himself against former clients and lawyers determined to put him out of business. In another case, former Azar clients Chris and Jamella Pappas also sued for false or deceptive advertising, but U.S. District Court Judge Marcia Kreiger dismissed that claim, finding that Azar's ads contained unspecific statements of opinion and nonactionable puffery. In 2008, Shawna Jimenez alleged at a civil trial in 4th Judicial District Court that she was duped by Azar's TV ads into hiring his firm, only to be persuaded to accept a shoddy plea settlement, The Gazette reported at the time. A jury awarded her $145,000 in damages, although the verdict was appealed and the case later settled under confidential terms. Azar asserts that his firm delivers on its promises through experienced lawyers who are skilled in evaluating potential outcomes and producing the best results possible. Among those now on his payroll is Patric LeHouillier, the attorney who represented Jimenez and other Azar clients who sued him for allegedly falling short of his promises. During a 90-minute visit to Azar's Aurora office by two Gazette reporters, Azar dropped any hint of confrontation and readily answered questions as he revisited his nearly three-decade history in advertising, which began in earnest in the early 1990s when he debuted an ad featuring a car falling on his desk and smashing it. "Hurt in a car wreck?" Azar asks in the spot. "Let me go to work to help you get the money you need for doctor bills, car repairs and pain and suffering." Thousands of ads that have aired since reinforce his familiar themes, quoting people identified as former clients as they list their six-figure awards, with a small print adding a proviso: "Previous results are no guarantee of future performance." Some ads tout settlements well in excess of six figures - with one ad quoting figures including $1.25 million, $1 million and $2.4 million. Every dollar figure and every client name is supported by a recent case, Azar said, adding that legal counsel reviews his advertisements for compliance with ethical rules. In defending his advertisements, Azar said they have a way of reaching people who otherwise may not have a way to access legal services - and those who would be unlikely to get a return phone call from a white-shoe firm. Azar said he learned early in his career, during a stint with a different firm, that many plaintiffs' lawyers eschewed clients who inquired about what he called "$100,000 cases" for being more trouble than they were worth. "I thought, 'If somebody could figure out a way to get to these people and do their cases, you could do pretty good and you could help people,' " he said. To reach them, he invests "millions and millions" of dollars a year, and to ensure they receive strong legal representation, he built a practice of 50 attorneys split across four offices along the Front Range - in Aurora, Pueblo, Trinidad and Colorado Springs. Some former clients who complain about his services came to him with preconceived expectations that were unrealistic, he said. While attorneys do not "force" clients to take settlements, they are professionally obligated to warn their clients about the risks of proceeding with a lawsuit against insurance companies who may countersue and win, Azar said. "They'll put your client in bankruptcy in 10 minutes," he said. As for questions about the quality of his legal representation, Azar said his firm has demonstrated its horsepower through multiple high-profile cases, including a series of successful lawsuits against retail giant Walmart for forcing employees to work off the clock, he said. They settled in 2008 for up to $640 million and forced broad changes in how the stores operate, the New York Times reported. Azar was a lead lawyer representing workers in 14 states. In another notable case, a former Trinidad High School football player represented by Azar was awarded $11.5 million after he suffered a concussion during practice and was left with severe brain damage and paralysis on his left side, the Associated Press reported. The jury found Riddell was negligent in failing to warn people wearing its helmets about concussion dangers, and the company was held responsible for $3.1 million of the damages. "After I did Riddell, I can't even watch football," Azar said. While many of his online reviews are positive - his law firm holds a 4.2-star rating on his Facebook page with more than 200 reviews - some former clients and their family members complain of unfulfilled promises from a firm staffed by unmotivated, difficult-to-reach lawyers. For Cindi McCutchen, whose granddaughter hired Azar's firm in the wake of a car crash, reality fell short of his "extremely misleading ads." "These people want to move you in and out like cattle," McCutchen wrote on the Azar firm's Facebook page, disputing promises of tough representation. In an interview with The Gazette, McCutchen said she dealt with Azar's firm last year on behalf of her granddaughter, then 18, who was injured in a crash in Denver. Although the other driver was found to be at fault, the teen's settlement came to about $6,500 after medical bills were paid and the lawyers got their cut, she said. The outcome left her feeling her granddaughter had become trapped between her lawyers and a stingy insurance company, McCutchen said. "The only one that's getting kind of squeezed here is the client - by both sides," she said in an interview. In a written response to the newspaper's request for comment on McCutchen's critiques, Azar's attorneys said McCutchen "was not a reliable or informed source" and threatened to sue The Gazette for "damages into the millions of dollars" if it published her criticism. Netzorg pointed out that McCutchen wasn't a client of the firm, and said recorded messages show that the granddaughter, who was the client, "authorize(d) a settlement amount below what the Azar firm eventually obtained" and that she was "pleased with the result." Netzorg's statement also said that McCutchen "attempted to interject unreasonable expectations that were not accepted by her granddaughter." McCutchen said her granddaughter authorized her to speak with the firm's attorneys on her behalf, and that she had multiple discussions with them about her granddaughter's case that left her feeling frustrated and ignored. Her granddaughter, Azar client Shaday Roberts, contacted by The Gazette, said she felt "at one point (an attorney) was very unprofessional and rude ... but (other) than that, everyone else was pretty fair." Roberts told The Gazette that she was happy with her settlement: "Oh, um yeah, I was." She confirmed she had verbally authorized her grandmother to work on her behalf. McCutchen remained unmollified in her Facebook post: "I have never dealt with a more rude, unprofessional and uncaring group of people in my long life." Many others offered positive reviews, praising Azar's lawyers as helpful, professional and responsive. David Loiacano, who was involved in a crash near Longmont in September 2013, said Azar's firm got him hundreds of thousands of dollars. Injuries from the crash forced Loiacano to undergo "a pretty major back surgery," which effectively ended his career as a mechanic. "It was a better outcome than I anticipated, to be honest," he told The Gazette. "I didn't really know anything going into it - I didn't know what the other guy's policy was or limits were. All they (the insurance company) had offered me at the time I went into this was like $3,500, and I got a lot more than that." A gauge of his firm's strengths can be found in another marker, Azar said - his firm's high proportion of repeat clients. "It's like anything - it's like McDonald's or Chili's," he said. "If you don't treat people good, they're not going to come back." "Seven Brides for Seven Sisters"